Do you want to be "debt-free" from all those credit card bills, overdue medical bills, personal loans, and other unsecured debts? How would you like to do it all for only $99.00 per month? 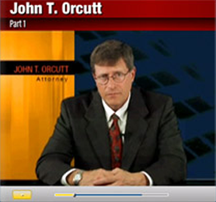 At the Law Offices of John T. Orcutt we have such a debt payment plan called the Debt Buster. If you qualify, you can eliminate your debt for good, and it’s all made possible by the new bankruptcy laws.